Vice President Mike Pence announced on March 26 the administration’s revised plans for Americans to return to the Moon within the next five years, as the 50th anniversary of the first crewed mission to the Moon approaches. 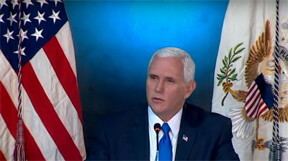 Speaking at the U.S. Space and Rocket Center in Huntsville, Alabama, Pence stated that the earlier NASA-estimated year of 2028 for the next Americans on the Moon was “just not good enough.” He went on to urge NASA to set “bold goals” such as landing a crewed mission near the Moon’s South Pole, which scientists believe contains abundant water ice for fuel and life support. NASA Administrator Jim Bridenstine echoed and expanded on Pence’s message by stating, “This time, when we go to the Moon, we will stay. And then, we will use what we learn on the Moon to take the next giant leap—sending astronauts to Mars.” Bridenstine will speak on NASA's implementation plans at the International Space Development Conference (isdc2019.nss.org) presented by National Space Society in June. On March 26th, Elon Musk tweeted, “Would be great to have a competitive, commercial program to build a moon base that is outcome-oriented (not cost-plus), so you only get paid for safe delivery of cargo.” NSS endorses such a program and believes that it is the only way the U.S. can get to the Moon within five years. For more information about the National Space Society’s plan for space settlement, see the 2019 Third Edition of its Roadmap to Space Settlement at: space.nss.org/roadmap. NSS is an independent non-profit educational membership organization dedicated to the creation of a spacefaring civilization. NSS is widely acknowledged as the preeminent citizen's voice on space, with thousands of members and supporters, and over 50 chapters in the United States and around the world. The Society publishes Ad Astra magazine, an award-winning periodical chronicling the most important developments in space. To learn more, visit space.nss.org. National Space Society's 2019 International Space Development Conference (ISDC®) (June 6-9) is the perfect place for space leaders, astronauts, enthusiasts and the next generation of experts to meet. ISDC® attracts men and women of all ages, each bringing unique skills and backgrounds such as aerospace industry leaders and startups, space exploration pioneers, academic thought leaders, students, teachers, and space supporters--all united by a common goal: to discuss the latest discoveries and projects on space development. See isdc2019.nss.org.